It looked nice, but it didn’t last. Just seven years into its 50-year warranty period, the slate roof on the Dawson’s family home in Oklahoma was falling apart. When the Dawson family decided enough was enough, they contacted Statewide Roofing for recommendations on a new roof. “We’re repeat customers for Statewide Roofing,” says Dawson. “This team goes to great lengths to protect our gardens and pool from debris. They always kept us updated on the status of the roofing project and they cleaned the yard daily. “Tony Gray, the owner of Statewide convinced us to try DaVinci Roofscapes composite slate tiles. Within weeks of their decision, the Dawsons saw a new DaVinci Single-Width Slate roofing system being installed. 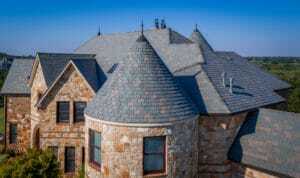 The DaVinci polymer slate roof made instant celebrities of the Dawsons in their community. Neighbors approached family members asking what product was being installed. They eagerly requested information on what materials DaVinci products are made of, and what color options are available. “When the next hail storm hits our neighborhood we expect several of our neighbors to switch to DaVinci composite roofs,” says Dawson. “The peace-of-mind that comes with knowing your roof overhead won’t get damaged by hail or blown away by strong winds is simply amazing. The Dawsons have come to recognize what other homeowners across the country have known for years — DaVinci’s commitment to creating durable, beautiful roofing tiles is unparalleled. Realistic and authentic-looks, the composite slate and shake products live up to the look of nature, but without the ongoing hassles of maintenance, repairs and replacements. Constructed of a composite material made of pure virgin resins, UV and thermal stabilizers, plus a highly-specialized fire retardant, composite roofing tiles from DaVinci outperform other roofing tiles. Precisely engineered to specific tolerances that meet a perfect composite formula for long-lasting beauty and performance, DaVinci products are ideal for standing up to Mother Nature — and Oklahoma’s extreme weather.